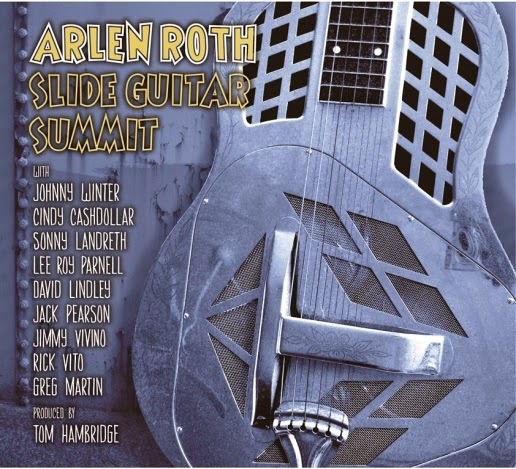 RIDGEFIELD, CT - Guitarist Arlen Roth announces that his new CD, Slide Guitar Summit, which teams the acclaimed musician with fellow slide guitar greats Johnny Winter, Sonny Landreth, David Lindley, Rick Vito, Jimmy Vivino, Jack Pearson, Lee Roy Parnell, Cindy Cashdollar and Greg Martin, will be released April 14 under the terms of a new deal signed with King Mojo/Garage Door Records, distributed nationally by Burnside Distribution. Slide Guitar Summit was produced by Grammy-winner Tom Hambridge, and recorded at studios in New York, Nashville and Connecticut. Called “The Master of the Telecaster,” Arlen Roth recently celebrated the upcoming release of Slide Guitar Summit with a special show at the City Winery in Nashville, where he was joined onstage by album participants Rick Vito, Jack Pearson, Lee Roy Parnell and Greg Martin for an amazing night of music. Fans that night were also treated to an advance screening of the one-hour film, Glass, Brass and Steel: The Making of Arlen Roth's Slide Guitar Summit Album. Guitar legend Arlen Roth is considered one of the most influential guitarists of all time, and during the course of his 45-year-career has toured the world and recorded with an amazing list of artists, including Simon and Garfunkel, Bob Dylan, John Prine, Phoebe Snow, Levon Helm, Ry Cooder, Eric Andersen, Dusty Springfield, Janis Ian and The Bee Gees, among others. His teaching and creation of the Hot Licks Video pioneered music and guitar education all over the world, with his videos having sold in excess of 2.5 million copies. His current online lessons and blogs for Gibson.com have over 1 million followers. 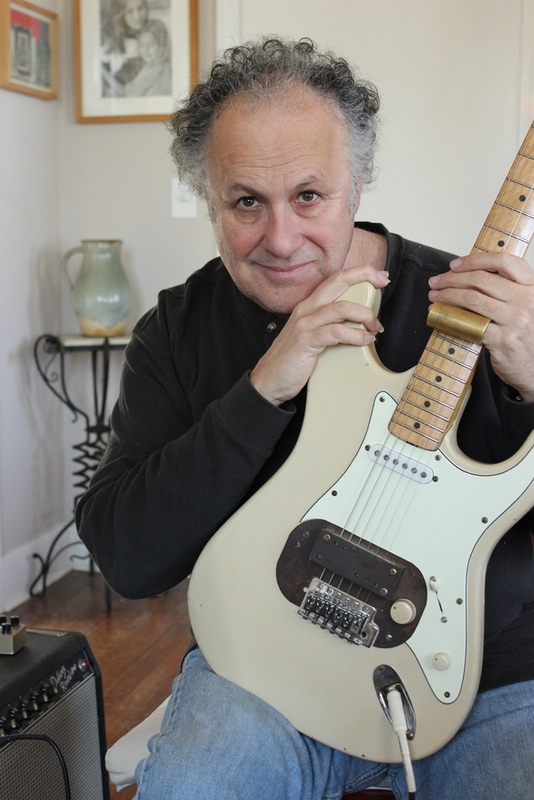 Arlen was also the man behind the legendary blues film, Crossroads, creating the guitar parts, directing the guitar scenes and working alongside fellow guitarist Ry Cooder and actor Ralph Macchio during the film’s production. He was voted in the “Top 50 Acoustic Guitarists of All-Time” by Gibson.com and in the “Top 100 Most Influential Guitarists of All-Time” by Vintage Guitar Magazine. He has eight best-selling books to his credit, and his book, Hot Guitar, is a compilation of 10 years of his wildly popular column for Guitar Player Magazine. Roth’s first album Guitarist, won the Montreux Critics Award for “Best Instrumental Album of the Year” in 1978, and his last album, All Tricked Out!, garnered four Grammy nominations. His new Slide Guitar Summit CD is similar in approach to his classic and legendary album, Toolin’ Around (1993), which featured duets with guitar greats such as Danny Gatton, Duane Eddy, Brian Setzer, Duke Robillard, Albert Lee, Sam Bush and Jerry Douglas, and which also became a film documentary. He followed up that album with Toolin’ Around Woodstock, with Levon Helm, Sonny Landreth and Bill Kirchen. Arlen Roth continues to record and tour all over the world. His current band, The Cordobas, features Eddie Denise on bass, Shannon Ford on drums and Chris Foley on second guitar. His daughter, Lexie Roth, also sings with the band, and has become a superb recording artist, vocalist and songwriter in her own right, with many credits to her name, such as singing on the recent Les Paul tribute album (she sang "Vaya Con Dios”), plus singing the blues classic, “Night Life,” on the album with Levon Helm. With songs that cover multiple genres of music, Slide Guitar Summit promises to reach a wide ranging audience of fans and promises to be one of the most celebrated albums of the year. Arlen Roth is also the founder and CEO of the “International Guitar Hall of Fame and Museum,” which has been a long-time dream for him to create.